Paris is an architectural wonderland without equal, and Berlin, the site of so many momentous world events, is the perfect counterpoint. A journey that takes in the marvels of both the Eiffel Tower and the Brandenburg Gate has to rank as something truly special, and those are merely the start and end points of an incredible itinerary. You can look forward to taking a closer look at European history, in its full sweeping splendour, from the French Revolution to the Cold War, as well as many of the continent’s finest cultural high points – Amsterdam, Vienna and the timeless charms of Prague. For most of the journey, you’ll be experiencing it in all-inclusive 5-star luxury on a Scenic Space-Ship. A world of wonder awaits you with a three night stay at one of our luxurious city central hotels. Discover Paris on a guided tour or marvel at the exhibits at the world-renowned Louvre. Alternatively, let a local Parisian show you another side of the city. Tonight savour delicious cuisine at the restaurant 58 Tour Eiffel before a short sightseeing cruise on the Seine River. Alternatively, take in dinner and a show at the world-famous Lido. Travel by high-speed train to Amsterdam, where you’ll board your Scenic Space-Ship. Tonight, you’ll get to toast the journey ahead at this evening’s welcome reception. Journey by coach to Prague, and spend three nights at one of the city hotels. Take a walking tour of Prague’s communist-era history, or visit beautiful Sternberg Palace. Tonight relish a delicious Czech highlight dinner. Enjoy a full day at leisure to explore Prague’s rich history and architecture at your own pace. Your Tour Director is on hand to help plan your day. Depart Prague for Dresden, perhaps the greenest city in Germany, and then Berlin, where you’ll stay three nights at our Special Stay hotel. Discover this fascinating city with an expert local guide. Enjoy an eye-opening visit to the Berlin Wall memorial or embark on a relaxing cruise on the Spree River. Enjoy a free day to explore to your heart’s content. Your Tour Director will be there to help you plan. After breakfast, depart with a lifetime of wonderful memories. On this luxury 25 day cruise, travel from beautiful Bordeaux to breathtaking Budapest. Visit Bourg and Saint-Émilion in France before cruising down the Rhine. 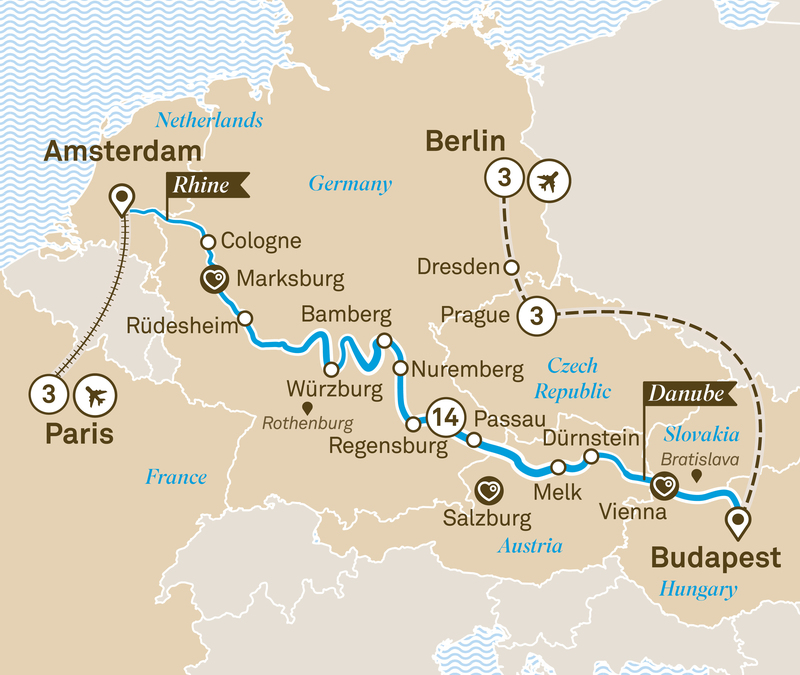 From Paris to Budapest, experience four of Europe's waterways the Seine, Danube, Main & Rhine on a luxury 25 day journey. Highlights include Paris & Vienna. On this 30 day luxury European river cruise, start in Amsterdam and take a long and intriguing journey all the way to the beautiful Black Sea to Istanbul.